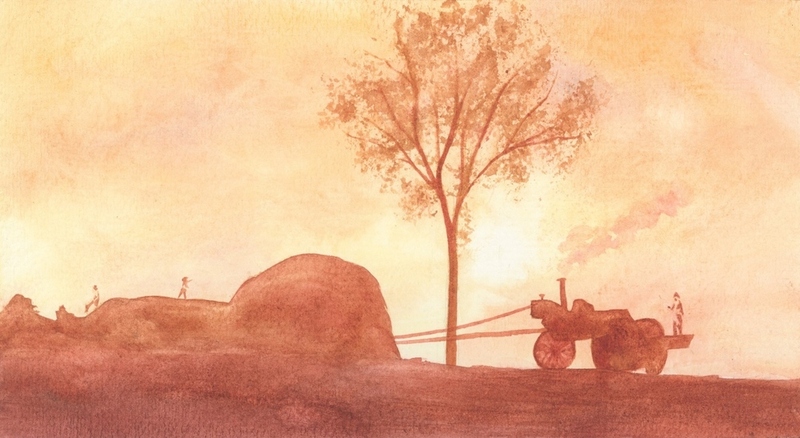 These paintings share stories of farming and agrarian tradition. Some are crafted from black and white photographs found in dusty closets, others are from memories told to me. They bring to life stories that have been tucked away and forgotten. Inspiring in us gratitude, pride and responsibility to carry on the traditions of our grandmothers and grandfathers; in both knowledge and sweat. I began to paint with watercolors as a child, alongside my inspiring and encouraging grandmother Doris Tiani. Throughout grade school my fondness of art continued to blossom with the mentorship and friendship of my dear art teacher Mrs. Art Clark. With high school came the opportunity to travel abroad in Italy, tracing my families roots and finding myself on a biological fruit and nut farm nestled in the foothills of the Italian alps. Attending, by happenstance, a school of art. It was here that I began to find my voice as an artist, welding patience and focus with instinctual ability. In college I studied agriculture and rural heritage, building a bridge between agrarian traditions of the past and models of agriculture that exist today. In searching for a balance between book research and a deep curiosity for the stories of farmers and farmland, I started to paint. These paintings are synonymous with the steady rhythm of the farm work and lifestyle I am embarking upon, as my partner Matthew and I help to manage my family's farm, carrying the considerations of my studies forward.